What Does The BREXIT Mean To You? 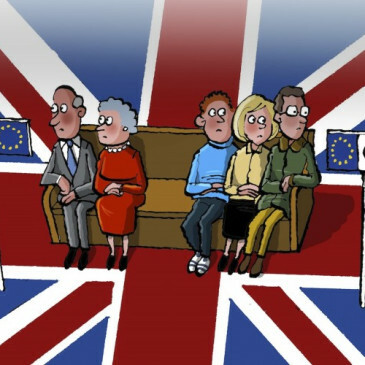 Voters in the United Kingdom chose to Brexit from the European Union (EU) late Thursday, June 23. The “Brexiters” (those who voted in favor of leaving the EU) were victorious, snatching 52 percent of the vote and setting Britain on a historic path to be the first country ever to do so. Stock markets reacted swiftly to the news. Asian exchanges, which were open as the results came in, fell sharply with Japan’s Nikkei 225 Average down as much as 8 percent and China’s Shanghai Composite lower by 1.3 percent. European markets opened the morning off as well. German and French stocks are down 6.8 percent and 8.5 percent, respectively. Financial companies and banks, especially those in Europe, have been the hardest hit with some down as much as 25 percent. Furthermore, our domestic stock markets pointed to a Friday morning open down more than 2.5 percent. The bank of England, the central bank for Britain, has promised 250 billion pound sterling to ease the markets. This will help create liquidity for the embattled currency. This had a somewhat calming effect and helped bring many off their intraday lows. However, global equities are still trading sharply lower than their previous close as is the British pound. The pound sterling was off as much as 11 percent yesterday before rebounding to close down 6 percent. In the short-term, we expect volatility to spike as investors reassess the global markets. Britain is already experiencing political fallout with the Prime Minister, David Cameron, announcing his resignation. However, he will stay in office for a few more months to ensure a smooth transition. The vote is historic and U.K. politicians have every intention of honoring the vote. However, while going through with the “Brexit,” the U.K. is still technically part of the EU and must abide by its rules and regulations until the separation is finalized. In the intermediate-term, much work is ahead in Britain. Trade agreements, treaties, and many regulations must be renegotiated and reworked. The U.K. economy and markets should experience significant volatility. The government will seek to reestablish its global relationships and put the country on the best possible path going forward. Long-term, the future of the EU is much more in doubt than it was two days ago. Whether the British know it or not, they are being watched very closely by other members of the EU to see how they weather the coming months and years. If they are successful in their separation, they could be paving the way for other countries to leave as well. We are watching the markets closely and will continue to do so, providing updates as it relates to U.K.’s economic future and what this means for investors in general. Although events such as these are impossible to time, we continue to stand by the benefits of a comprehensive wealth plan as well as the process we follow in volatile situations such as these.